Photos doesn't have a rating system, but there's still a way to work around it. 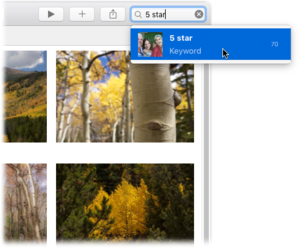 One of Apple Photos’ most powerful features for tagging pictures is keywords. They let you apply any number of descriptive words such as “food,” “vacation,” “kickboxing,” or “kitties” to your images and videos. By searching for text included in the keywords you apply—using the search field or a smart album—you can locate specific pictures and videos quickly, regardless of which album, moment, collection, or year they’re in. Since Apple hasn’t yet seen fit to include a star-rating system in Photos (even in version 1.2), keywords may become your new best friend. 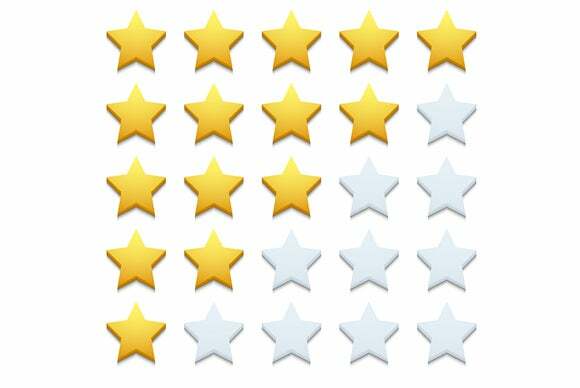 In this column, you’ll learn how to use them as a slick and easy star rating system. If you used star ratings in Aperture or iPhoto and then imported your library into Photos, then keywords already exist for “1 star,” “2 star,” “3 star,” and so on. If you didn’t, you can easily add them using the Keyword Manager. To open it, choose Window > Keyword Manager or press Command-K. In the resulting dialog box, check to see if the aforementioned keywords exist. 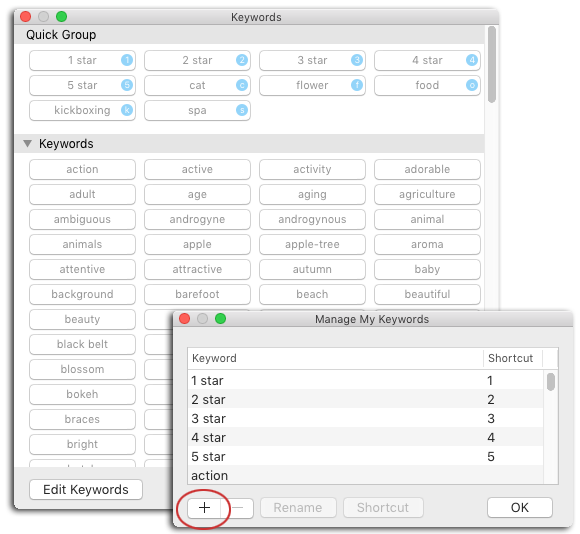 If they don’t, click Edit Keywords and Photos opens a second window named Manage My Keywords. Click the + button at lower left, enter the keyword “1 star,” and then click OK. When you do, Photos automatically assigns a one-character keyboard shortcut to the new keyword (it’s displayed in a light blue circle to the right of the keyword, visible in the screenshot below). The keyboard shortcut that Photos assigns to your keyword is based on the keyword’s first, second or third letter. (If the first letter is already taken by another keyword, it uses the second letter; if the second letter is already taken, it uses the third, and so on. This ultra-handy keyboard shortcut lets you apply that keyword to your selected thumbnail(s) by simply pressing that key on your keyboard whenever—this is the important part!—the Keyword Manager window is open. (If the Keyword Manager isn’t open, absolutely nothing happens, no matter how many times, or how vigorously, you tap its shortcut key.) So to instantly assign star-ratings to a picture, select a thumbnail (or several) and then tap the appropriate key on your keyboard (1 to 5). If the image is open, or if you’re in Edit mode, the process is the same—press the keyboard shortcut that represents the keyword you want to assign. Either way, the keyword momentarily appears atop the photo to confirm your choice. Once you’ve applied keywords to some images, you can then find all your starred items by entering “1 star,” “2 star,” “3 star,” and so on into the search field at the upper right of the interface (you don’t need to enter quotes). When you use the search field to find your starred goodies, Photos tells you how many images match the keyword. For even greater convenience, consider creating five smart albums—one for each star rating. For example, to create a smart album for your five-star goodies, choose File > New Smart Album and name it “5 star.” Set the menus in the first criterion row to “Keyword,” “is,” and “5 star,” and then click OK. Photos scours your entire library to find photos that have the “5 star” keyword applied, and dutifully includes them in your new smart album. And as you apply that keyword to future items, Photos automatically adds them to that smart album. Why bother creating smart albums for lower-rated images? So you can delete them en masse. For example, if you create a smart album based on a “1 star” keyword, you can periodically open that album, press Command-A to select all the thumbnails it contains, and then delete them from your Photos library by pressing Command-Delete. This particular smart album finds all the images that include the keywords “5 star” and “kickboxing”. While keywording images and creating smart albums may not feel like fun to some, it’s well worth the effort. Doing so lets you trigger an instant slideshow of your cream-of-the-crop shots whenever a viewing opportunity arises, quickly locate your best shots for inclusion in a book, saved slideshow, or calendar project (these make great gifts), or display them on your Apple TV-connected device. Until next time, may the creative force be with you all!